This originally appeared as a feature article in Range magazine, but I’m posting it because it shares so much of my heart. The original farmstead settles into the hillside as easily as the sun rises and sets. Some things are just meant to be. The home has been remodeled, but the heritage held there never diminishes. If you stop and look long enough, you can almost picture the horse drawn wagon that brought the family over decades ago; that first rancher exuding hope and desire to carve out a respectable living. Now, in a new millennium, with unprecedented change around us, this ranch stands with pride as a fifth generation continues managing the land and carrying on their agricultural roots. Uneasiness about the future of agriculture gives way to hope with stories of continuing generations. This picture is familiar for many farmers or ranchers we know. Many of those now ranching carry a rich agricultural background. Each generation has the task of carrying on the family homestead, usually implementing and adding a few new ideas of their own. There is an intricate weaving of lives with those who have carried on their family inheritance. The Smiths have always bordered the Jones’ and helped each other during shipping, branding, and the likes; while the Johnsons always call the Millers when there is pasture available. Ties and tradition runs deep, as well they should. The beauty of a legacy should never be forgotten nor taken for granted. A legacy usually denotes authenticity because these families have proven themselves capable of the lifestyle and shown concern for agriculture. However, agriculture is continually changing and unfortunately can prove to be a challenge. Many have sold their family place to move on to somewhere more affordable. Others have downsized herds. Still others have taken outside jobs or subdivided to make ends meet. Some simply grow up never to return. According to the National Agriculture Statistic Survey (NASS) for 2007, 125,000 farms produced 75% of the value of US agriculture production. Small numbers do not always mean small affects. The face of agriculture may be changing, but it is still accomplishing big things, usually on small budgets. In fact, of the 2.2 million farms nationwide, only 1 million even show positive net cash income from farm operation. Yet they keep contributing because they know what they are doing is beneficial. They know our country needs the agricultural heart to beat strong. It was this heart that attracted us to ranching. You see, our family heritage is rich in other ways than land. Lacking are the fence lines first put up by our great-great grandfathers. Absent is the farmstead first settled during the Homestead Act. Never present are the reminders of generational agriculture; you’ll never hear a favor extended because they knew our granddaddy or recognized our last name. What does exist is an insatiable desire to begin a new homestead of our own in an age of development and high dollar vacation ranches. Unable to quench our hope of adding some small sliver to a rebirth of agricultural proprieties and keeping rural America alive, we’ve jumped into the arena as first generation ranchers. We are not the only ones. We’ve seen people start over on their own after the rest of the family decided to sell out. We’ve seen homesteads become too crowded and necessitate new family sprouts. What is happening is hardly an epidemic, but it is worth noting. With the average age of the ag producer rising, many are hopeful that upcoming generations will return to their roots and become ag producers themselves. We too hope that happens, but there are those of us who lack a legacy, yet desire to fill the boots as young ag producers. For ranchers with fresh roots, challenges loom. Land prices are higher than many of us can try to grasp, so we lease. It is always somewhat of a gamble each year: we need a certain amount of AUM’s for our cattle, but often grazing ground is leased long before we even hear about it. We can’t blame those who have been here long before us; why should they trust us when they don’t know us—or any of our relatives? Agricultural roots are something to be protected and it’s not easy to convince people around you that you take that seriously while simultaneously trying to make a name for yourself. My husband grew up around ranching to be sure. It was not a family affair, but would-be friends sensed his sincerity and took him under their wings. He spent time on several ranches from Tennessee to Montana before getting dual degrees in Animal Science and Agricultural Business. At that point, I entered the picture as a new bride sharing his passion, and we spent time on different ranches just cowboying, until ranch management became possible. After this, the lure of starting something of our own overcame us. So we took on more schooling, additional jobs, and delved into the world of first generation ranching. Starting out with a whopping ten cows almost as old as we were, we watched as our ten became twenty, then thirty…growing into the ninety we have today. It isn’t easy though. We watch as the good old boys get leases that would have revolutionized our operation. We understand why, but we are ever hopeful that someone will take note that our scraggly bunch of cows isn’t so scraggly anymore. That after years of comments like, “some boy down the road bought himself a couple cows and thinks he’s gonna be a rancher!” (followed by raucous laughter), it will be noted that we are still here—and growing. Sticking it out is hard without support. We’ve been asked why we keep going. Yet isn’t there something in everyone’s life, some dream that feels elusive, yet entirely captivating, that propels us forward? Some hope that we can make a difference? 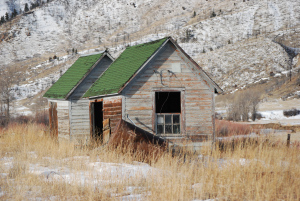 Judging from the success of westward expansion, we aren’t the only ones hoping to find a treasure in rural heritage, we’re just over a century late. Or are we? In a time of economic downturn, we are all whittling down to only basic necessities. Will this take us back to a time of simplicity? A time where we step back and look at what brought us down this road? Will we recognize the intrinsic thread of agriculture in a nation that once treasured every aspect of its existence? That’s not to say that agriculture has not received respect, but certainly if the nation realized what a cornerstone it plays in our country’s success, yet how terribly trying, labor intensive, educationally necessary, not to mention how subject to acts of God, would we pay homage to this life giving facet? Recently I heard a broadcaster commenting on the economic downturn and how the only ones making out in this bust were the farmers. If I could’ve found contact information, I’d have given a rebuttal. They can look at our gross income and be somewhat impressed, but have they tried to buy a tractor, or hay, or fertilizer lately? Do they have any idea what the profit actually equals? Do they know that 60% of all farms report less than $10,000 in the sales of agriculture products? Do they have any idea that 65% of all farmers work off-farm too to supply income for their families? Extreme effort backs most agricultural enterprises. A forty hour work week would be a vacation. To supplement our endeavor, my husband works as an agricultural land appraiser. Even though our ranch is small, our agricultural heart is strong and we’ve been welcomed in the past few years as members of the agricultural community. Our neighbors now come for branding and shipping, and we do the same for them. So to go against the tide that says we’re making out like bandits, to go against development, takes guts. It is the hope of a legacy that keeps us wanting to grow. We still only own the land we live on, but so far leases have worked out. We’ve found support and camaraderie in our friends and neighbors. What we hope continues to pulse in us is the beat of the agricultural heart that has carried so many families, so that the three children we now have will be able to say: We’re second generation ranchers. Hopefully our children will understand the sacrifices much the same way so many of the fifth and sixth generation ranchers do. With any luck, they’ll recall fond memories of feeding a bottle calf, lessons of life and death learned only through ranching, and they’ll realize that they are a huge reason we stick it out. And maybe, just maybe, by the time they’re grown, there’ll be a homestead they can come back to, where our family heritage will continue. A place where a new ranch thrives, not because we’re trying to be something we’re not, but because we’re trying to grow into who we were meant to be.